This section is dedicated to the running of a race night. A summary of points awarded and championship structure can be found at the end of the Racing section. Practice is free. Anyone who wishes to, may practice between their arrival and the beginning of racing. As there are only two slots at each track, each person limits himself to 5 minutes practice time. Slots are named track 1 and track 2 (or, prosaically, track red and track blue - see the technical section). During that time, as many different cars as desired may be tested. As well, should the other person practicing agree, testers may switch from track 1 to track 2, and vice versa. Braids may be tweaked, and tires cleaned, at any time. No other alterations of the car may be carried out by the drivers at any time during the racenight. This is also the time for initial socializing, and the first beer of the night. However, a driver may not take a drink into the racing area. Decisions, decisions! Qualifying is not often carried out anymore. In previous years, every driver would run a qualifying run to determine initial seeding, but it has basically been replaced by a draw of cards for initial position. As qualifying is the only way to establish a track record, the records have not been broken for many years (see the track section). Qualifying is over the same number of laps as a typical race - 3 laps at Traill and 2 laps at Donaghadee. Timing is accomplished by an analogue clock connected to the same circuit as the power supply for the track. When a driver comes off their track, they kill the power to the track, stopping the clock. Their car is then reseated on the track at the point from which they left, and they are free to turn on the power at their convenience. A driver may have one qualifying session per night. 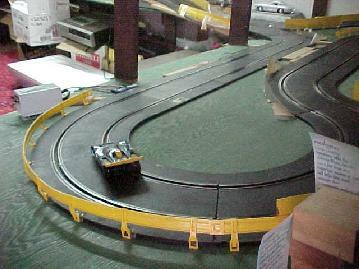 A single car and track must be used over the session. The tires and braids may be cleaned and tweaked prior to the start. After the beginning, tires may not be modified (except to re-align should a tire come off its wheel during driving). Drivers are seeded from fastest to slowest time. Races are for a fixed number of laps, and the first past the finish line wins. The racers either challenge for or defend a position. the winner assumes the position occupied by the defender, and the loser assumes the position of the challenger. For example, if seventh seed challenges third seed, the winner of the race becomes the third seed and the loser seventh. Each series is in ladder format. In the past, forward and reverse ladders were used, but currently forward ladders are exclusively used. A "forward 4" ladder would mean that, as cited above, a position would challenge the seed 4 positions above. When the challenger is less than the ladder's step away from the top seed, the step is reduced by two and the ladder continues. This is repeated until the step is reduced to zero or less. 7 challenges 3, then 6 challenges 2, then 5 challenges 1. The step is reduced to "forward 2" and 4 challenges 2, then 3 challenges 1. The step is reduced to 0, and the ladder is complete. 7 challenges 2, then 6 challenges 1. The step is reduced to "forward 3" and 5 challenges 2, then 4 challenges 1. The step is reduced to "forward 1" and 3 challenges 2, then 2 challenges 1. The step is reduced to -1, and the ladder is complete. Challenger has choice of track (1 or 2) or car (from the club pool, see the cars section for photos). The Defender then can choose both car and track, leaving the Challenger to select their car if track was chosen initially, or to inherit the remaining track if car was chosen initially. Racers may clean their tires and check / tweak their braids, and drive their car 15 or so feet to the start/finish line. Power is shut off once both cars are in position to start. Power is turned on by the Challenger once both racers are ready. Should a car come out of its slot ("off the track" in club parlance), the racer of that car will switch off the power. Once the car has been reset on the track at the approximate place where it left its slot, the driver who did not come off will turn on the power once both drivers are ready. Should the car come off in the Monza curves (see the track section, Donaghadee's layout), it shall be moved forward 3 or 4 track lengths, and the other driver's car shall be moved ahead the same amount. A dead car may be replaced at any time, but the replacement may not be cleaned or adjusted prior to racing. Any other mechanical failure shall be repaired and cars returned to the position they were in when the failure was detected. Once a race is complete, there will be no protests allowed based on mechanical failure. "Nerfing" (intentionally knocking off an opponent and not coming off) is thought of as "good form." Intentionally crashing into an opponent is "bad form." Final races for a race night (last ladder, 2 challenges 1) are generally longer in duration - 5 laps at Traill, 3 laps at Donaghadee. Points are awarded based on final standing: 20 for first, and (20 minus seeding) for any other seeding. The season champion is the racer with the most points. There are two championships, the "A" championship and the "B" championship. The top drivers vie for the "A" championship, while slower drivers vie for the "B." Winners of the "B" are automatically moved up to "A" level for the following season, while the lowest-scoring active driver in the "A" series is dropped to the "B." The club championship is held on a spring Saturday in April every year after the season has concluded, and consists of two full race schedules, with the morning racing at Donaghadee and afternoon at Traill. The champion is crowned in a runoff between the winner of the morning session, the winner of the afternoon session, and the top two points-getters who did not win a session. Should the same driver win both sessions, no runoff is held.